A little personal tmi/history: I have had a longtime aversion to buying new clothes, and generally try to keep my acquisition of new things to new-to-me things. i have a pretty decent collection of casual-but-attractive clothes, but old clothes fall apart eventually and I don't know if I can really continue to wear this dress from The Limited that I got for my college graduation to work once a week. It has had a good run. There's nothing wrong with it, but I have been wearing it on and off since 1997. Time for some new old clothes. I do buy new things -- don't get me wrong -- but I have long enjoyed the experience of thrift store shopping. It's a really homey feeling for me, for better or worse. * homemade off-the-shoulder huge front ruffle ties in the back around the waist peasant style dress -- omg this thing, it is crazy and kinda fits but a little large in the bust, but that's covered by the ruffle. makes me feel like emmylou harris only without her head, unfortunately. Most interested in The Ruffle tbh. What color is the peasant dress? It's blue and purple flowers with a lace bust ruffle. This hilarious man at the checkout next to me said, "Oh that dress is very nice. No man will ever look at you in it." and I was like O_O Mister, are you blind? He clarified by saying that what he meant was that it was very European. Maybe I'll give it a spin in front of the camera and just crop out my head. You'd think it's a hilariously awful dress! None of that exchange makes the slightest bit of sense but it does crack me up. OK so what kind of thrift store do you find the best stuff in and do you generally spend a long time searching for things? $8.50 for three dreses is extremely appealing. * when you take a spin around the blazers to see if there's anything good, you can take a little side trip to the mugs and records, maybe even lamps if there are a lot of them. tapes are everywhere too. * there are no boxes or packaging or advertising costs involved in the transaction you make there. usually it's one of two places, one independent thrift store with some kind of environmental cause behind it and a salvation army in evanston. and a lot when i go home to ohio. stay away from anywhere near hipsters, but near a college is good because college kids often give away their nice clothes that their parents bought them, at least IME. OK, that's basically what I was wondering. There's a local chain of the curated kind around Boston that I've always been curious about. I will give them a try some time soon. Oh that site is interesting! j - will take you up on that if i ever find myself out that way! I will take some photos next time I'm in there - their stuff is insane!! You're welcome! I knew you were an enthusiast, this will be our palace. EA do you have experience with Poor Little Rich G? I think there's one in Prov. Oh wait - there's only one of those. I think I was thinking of Second Time Around. i have a general method of approaching thrift stores. oh you gotta have a method! i look for magazines and books (heavy), then women's shirts --> dresses --> purses ---> hats ---> shoes ---> nighties (shut up, i found a lot of pretty things in there) then put some stuff back, then finally records and housewares. usually. sometimes i skip the clothes because i can tell there won't be anything. There's a giant Goodwill by my office that I go to usually to look for costume accessories etc when I'm goign to a theme party or whatnot. I tend not to shop for clothes a whole lot, bc I find that a v disappointing exercise being larger than most of the stuff on the racks. I tend to limit myself to jackets, occasionally glance at skirts. also - i skip pants usually because really, like i am going to find any pants that fit me? ha. it has never happened. i used to look for men's pants when i was a teen who wanted to disappear and even got some super sweet and durable *perfectly snug* turquoise Levis cords from the little boys section yeeeeears ago (RIP) but i think that covers my success with used slacks/jeans/trousers/pants. also lol because 'second time around' is just the most common predictable names for a consignment store, like that or 'second helpings' or 'second-hand rose' or whatever. ANYWAY, my clothing scores have been limited lately, the only thing of note would be a couple vintage pendleton wool shirts and a few ties. always, always with the neckties. oh, well that's not entirely true, i did buy a vintage denim jacket during my trip to the east bay (i needed a layer, so) -- it's got a navy / gold / red wool plaid for the collar and placket facings, raglan sleeves, and a drawstring waist? it's a bit odd and is fitted more like a parka than a denim trucker jacket. but it's nice & i like it. I've lived in poor areas for a while, and the goodwill & second-hand stores are useless except for housewares so that's the only section I check (but housewares can be a good mine--witness the rare Fiesta candlesticks I found this summer). Would have to go way out of the city, or else uptown to rich neighborhoods to find good clothes. A long time ago, around 2001-2003, I used to take the train out into NJ to Paterson and Passaic and walk from the train station to a local Sal Arm in a building with one of those big chalet-style rooflines and an all-glass front wall. It always had THE BEST STUFF, including great furniture that I just had no way to truck home. My favorite shirt in the world in my entire life came from there, it says "Vulcan Science Academy" on it and is the perfect degree of falling-apart soft. The Red, White, & Blue in Paterson used to be amazing as well, I bought a bunch of silk Vera scarves from there for $2 each. it would depend on what you consider a treasure, no? wait is this one item or two? Although the Japanese consumer has a history of high purchasing power and discriminating tastes, currently consumers report having less to spend on clothing. Price sensitivity is increasing, changing the way consumers in Japan shop for apparel. Overall, Japanese consumer apparel spending has declined steadily for many years. According to Euromonitor International, apparel spending fell 19% from 2000 to 2009 and is projected to fall 9% from 2009 to 2010. I think there's a lot more work that can be done on predictive algorithms as far as what clothes you may/would like. Multiple sites are doing this now, as well as thredUp. I just got a promo email from thredup with "we think you will like these items" - and none of them were things I'd want, all very basic, staple-y stuff that is kinda the opposite of what I like. i scored some nice stuff at the goodwill near my grocery store recently. a few shirts for work, a red/black polka dotted cotton dress, a stretchy black a-line dress with a little white collar and sleeves that isn't too tight, and a replacement gray cardigan because mine had a hole in the armpit. can't write on a chalkboard under those circumstances! I just watched the newest season of Love on netflix. It's really making me want to start scouring for vintage clothes again, although I got rid of so much 2 years ago when I realized that I am never that keen to wear all polyester. also yesterday i brought home one of those classic thrifted women's cardigans with a little shell pattern on it, totally acrylic, you know these sweaters. mine is yellow but they come in easter egg colors like light blue, pink, white, yellow. i haven't posted a pic to ilx in ages -- idk how to do it anymore!? the sweater is something you probably saw on someone you knew in high school or college -- these fully synthetic old lady sweaters have been floating around since i was in high school and almost everyone i knew had one. to the point where i never bought one because we can't all go around wearing the same sweater...until now! this is within your grasp -- we are living in a rich era of wacky affordable clothing. i looked around at Target the other day and marveled at the variety. It almost made me want to stock up for those times when things become more austere. 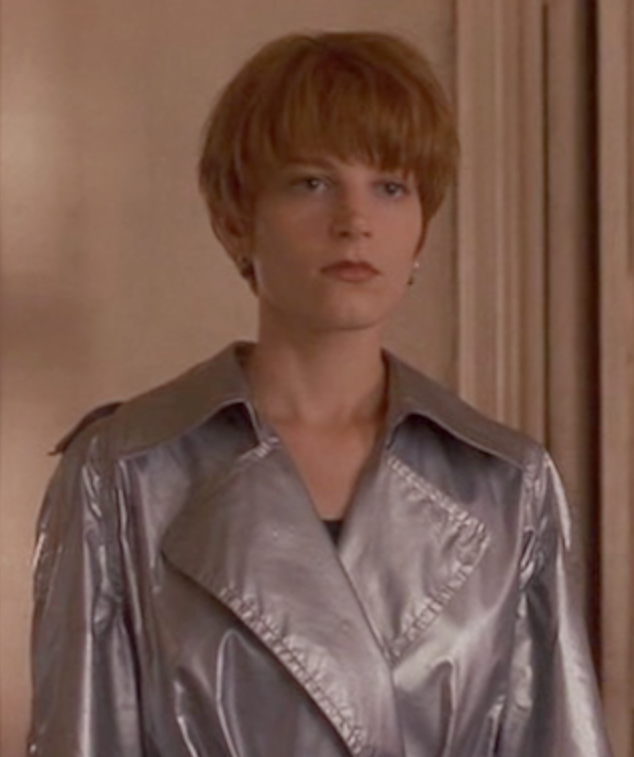 I need a raincoat and am now looking up silver raincoats. who are those miserable-seeming people? 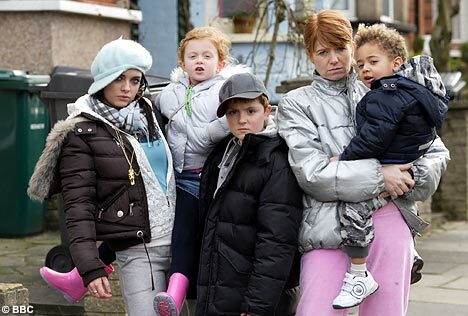 sorry, that silver puffa jacket is kind of famous over here! no need to apologize! i wish we all could be more forgiving of people not knowing things/needing to ask questions, self included. also i will mention that upon paying my $14.33 i felt a palpable noticeable surge of whatever that good-feeling hormone is. like i felt flushed with...what is it? joy!!!???? also, a not very exciting boatneck-ish black crushed velvet blouse that I bought for exciting refashioning -- a year or so ago I got rid of a bunch of clothes that hadn't really fit me since the late 90s ... including a half dozen cute patterned bras that I took apart and kept the cup fabric, which works well as a stitched on collar for a boatneck, scoopneck, crewneck, etc. omg that is so cool -- how satisfying is it to wear a garment with a decorative bra cup collar?!?!?! we should wear our black/blue leopard sweaters together sometime!! yknow i have seen online animosity/competitive behavior between kondo-enthusiasts and thrifters -- 1) this is divisive and 2) who cares? don't fight amongst yourselves. keep giving it away/recycling your stuff and everyone's happy, the ecosystem is healthy. it's cooperation not competition!! so weird! - the animosity/competitiveness - is it that the kondo-kin think thrifters are hoarders or gluttons in need of discipline or ...? idk what they think honestly -- that seems otm based on what i can glean from the snarking i have seen. to me it just seems like "defending my 'position' means insulting yours" mindset that seems to plague some modern online discourse. unfortunate, imo. i'm sure some people would say "lighten up, it's a joke" but isn't that what people always say to excuse themselves? idk i wish we could celebrate because this is a win-win for everyone. That is so strange! Yeah, it would seem like a mutually beneficial system. it is symbiosis of the highest order, what's not to like!? “It’s a good time for thrift shopping. I have the people who are purging, and then I have the people that need those things and can have access to them at a lower price. It’s a beautiful, mutual symbiotic relationship,” she said. i have plenty of things to get rid of too. maybe i should organize a swap. i found the handout i made for aspiring swap organizers for my speech class last semester and i make it sound so easy! maybe it is easier than i think it is. what is the most inclusive language for inviting women + femme people of all stripes ? is the swap just for women's clothing? Others I've seen have been "all genders/gender identities welcome" -- but if you want to specify that the clothing to be swapped is gendered, do that separately? Also, you may want to say something about sizes. this is why i haven't hosted before. too complicated! then i would say, "women's and children's clothing!" "all sizes and gender identities welcome!" ok thank you -- that is helpful!! i also want people to know that even if they don't have stuff to bring or don't want to swap they are still welcome to come over and hang out and meet some new people/talk with me and who knows -- maybe a free accessory or other item may fall into their laps! you never know what you're gonna get at a swap. i will def let you know how it goes.